The Lamborghini Urus – the first SUV from an Italian supercar brand — could have gone so wrong. It’s turned out brilliantly. It’s incredibly fast in a straight line, has phenomenal stopping and cornering power and can even be a comfortable ride in town at low speeds. The big risk here isn’t the car, but whether Lamborghini has the sales discipline not to gorge itself too early. Back in 2003, the V10 Lamborghini Gallardo was a revelation. Now it’s 2018 and the Lamborghini Urus, which has just been launched in Europe and arrives in Australia mid-year, punches harder than the Gallardo to 100km/h and has more stopping power than the nimble, lightweight sports car that rebirthed the brand. And it’s an SUV. That you can use every day. In fact, the Urus is so crushingly, overwhelmingly, shockingly good at what it does that nothing like it has ever been seen in the car industry before. Cayenne Turbo? A valiant trifle. BMW X-anything M? Oh, please. AMG’s fleet of 4.0-litre biturbo SUV bustlers? Or even the Jeep Trackhawk? Not remotely close. Sure, plenty of them can go hard in a straight line. Some of them even stop passingly well more than once. None of them fill the time between slowing and going even remotely close to what the Urus is capable of. Most of them are dead-ahead Freds, accelerating and braking (a lot) before they can turn and go again. That’s not the Urus way. The Urus’s breadth of ability bundles both the braking zones and the corners themselves into the entertainment package. Its body control is phenomenal, its grip levels astounding and its agility is unprecedented. Headlines will mostly be written about the engine performance, and well they should. It’s stupidly fast. And loud. And responsive. And very, very Lamborghini in character, despite being its first turbocharged production engine. It should be strong, too, with 478kW of power and 850Nm of torque from the 4.0-litre twin-turbo V8. It’s based off the Audi RS 6’s motor, but heavily revamped for Bentley and Lamborghini work, though exactly who did the revamping is a subject of heated and differing opinions between Lamborghini, Bentley and Audi Sport. It runs all that performance through an eight-speed automatic transmission, through a clever, constantly variable centre differential, forward and backwards to tight differentials and finally allocates it to tortured rubber (that varies from 21 to 23 inches). And it does all of that with enough herbs and spices to bellow beyond 100km/h in 3.6 seconds. Yes. Three-point-six. Then it adds on for the second layer of 100km/h, reaching 200km/h 9.2 seconds later. Then it runs out of puff at 305km/h – and even that is speed limited to protect the tyres. And it’s just under 2.2 tonnes. That’s not traditionally a great basis for a supercar, eschewing as it does Lamborghini’s preferred carbon-fibre for a mix of aluminium, high- and very high-strength steel and magnesium. From another perspective, though, it’s fully 300kg lighter than the Bentley Bentayga with which it shares most of its core-critical pieces. It’s also comfortable when you want to drive it around town, calmly. 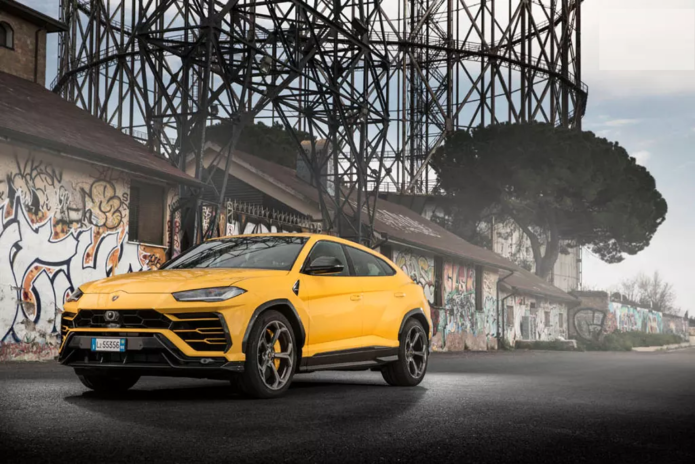 There’s room for a hybrid version at some point in the Urus’ future, which will be a boon to anybody wanting to slip back into suburbia unnoticed, while dodging the 12.7L/100km consumption Lamborghini claims for the regular version. Its ride is comfortable, supple and even, the pedal and steering efforts are easy, the interior infotainment set-up is a huge step forward for Lamborghini (but familiar to any Audi Q7 owner) and it’s even practical. It carries four people well — five if it has to — and how many other Lamborghinis have 616 litres of luggage space? It’s based around the Volkswagen Group’s MLB Evo architecture, developed mostly by Audi (which is, nominally, Lamborghini’s parent company). It shares a lot with fellow MLB Evo machines, like the upcoming Volkswagen Touareg, the Audi Q7, the Porsche Cayenne and the Bentley Bentayga. The good part is that it gave Lamborghini access to tech it couldn’t have afforded on its own, like +/-three degrees of rear-wheel steering, an active rear anti-roll bar, three-chamber air suspension all around and an enormous suite of safety, entertainment and driver-assistance systems. It even has everything it needs for Level 3 autonomous driving, including the sensor suites and the Audi A8’s zFas computing system, but Lamborghini hasn’t switched it all on. The downside to this technology sharing is, well, minimal. Lamborghini might have made it lighter on its own, but not with the ability to make 3000-3500 of them lighter every year. Besides, it has heavily re-engineered it, from top to bottom, to make it more like a Lamborghini. That means it won’t be for everyone and just looking at the polarising body design will lock some people into the “like” category or the other one. It’s unmistakably masculine, even in its Strada mode with the engine firing up with an offended blip before settling in to a deep, sometimes rumbling idle. From there, you manage what you want: how loud you want it and how fast you want it from the Tamburo (it’s Italian for “drum”), a (funnily enough) drum-shaped switch in the centre console that changes the car’s character from Strada (“street”), Sport (err, “sport”), Corsa (“track”), Sabbia (“sand”), Terra (literally “earth”, but here it means “gravel”) and Neve (“snow”). These flick the Urus between its range of preset engine, gearbox, driver-assistance, suspension, differential and steering levels. Or you can go your own way with the “ego” setup, which lets the driver split the suspension, steering and powertrain settings. So there are three languages within five centimetres (Italian, English and Latin). The Tamburo is initially a bit frustrating on the road because you flick it into Sport mode when you find a bit of smooth blacktop with some corners, only to need five downward taps to get it back to Strada. Eventually you realise one long pull will reset it straight to Strada and then it all makes much more sense. The seats are incredibly comfortable, with up to 18 ways of electric adjustment on the front buckets and the choice of manual or power adjustment for the steering column. The top versions are heated, ventilated and deliver massage functions. Most Lamborghinis use their engine vibrations to give massages to their drivers. The infotainment screens are identical in layout and performance to the new Audi A7, with the top screen in charge of entertainment, navigation, telephones etc, and the bottom one is there for both climate-control and fingertip-writing inputs. There are also voice-control and standard touch-screen steps for data or address input. It has a dedicated phone holder with inductive charging, connects to Apple CarPlay, Android Auto and China’s Baidu-Carlife set-up, plus there’s an optional head-up display and shatterproof tablets for rear-seat entertainment. The stock audio setup has eight speakers and four channels, but that steps into a Bang & Olufsen 3D sound system with 1700 watts and 21 active speakers. The instrument cluster is also digital, with a huge range of options including a graphic with the power and torque you’re using at any point, another graphic with the percentage of power and torque, another for the lateral forces (we saw 1.1g in acceleration alone) and so it goes. The rear bench seat folds and slides to allow up to 1596 litres of luggage space, with an 85-litre fuel tank beneath it. And it can even come with two individual rear seats, with full electronic recline and massage functions, for the full big-money experience. No car company in the world has bigger brakes in production. None. It’s important to lead off how it goes with how it stops, because no other SUV stops like the Urus. And no other SUV needs to, because no other SUV can arrive at its braking points carrying this much speed. The carbon-ceramic discs are 370mm in diameter and 30mm thick, squeezed by six pistons in a floating cast-iron block. And that’s just on the rear axle. On the front, the anchor set-up is enormous, with a 10-piston monobloc alloy fixed calliper doing its best to engulf a 440x40mm carbon-ceramic disc. I mean, I live in Italy and they don’t make pizzas 440mm in diameter. The reason the brakes are so crucial to the handling envelope is that very few performance SUVs stop properly more than a few times in a row and fewer of them use the brakes with this much accuracy. And from 100km/h, it will be stationary again in 33.7m, which is just incredible, given the energy shuffling involved in making that happen. The first time you plant the throttle in the Urus you will involuntarily make noise. It won’t be heard above the bellowing, rumbling V8, but you will make noise. Sometimes it might even be a coherent word, but mostly it will just be a noise. That’s because something this big should go this hard. It shares its core architecture with the rest of the Volkswagen Group’s big end of town, sure, but it doesn’t share their agility. At 3003mm, its wheelbase is about 5mm longer than the Q7’s and considerably longer than the Cayenne’s. It’s also 5112mm long, so it’s about 7mm longer than the Q7 and it’s also very, very wide, at 2016mm – before the mirrors are factored in. But it’s a lower than the others, at 1638mm to the top of the roof, and its driving position feels a lot lower than a Range Rover Sport or the Cayenne Turbo. Because it is. That sounds like an intimidating beastie to poke around in and it is, but only for getting in and out of garages. The rest of the time, the enormous SUV feels considerably smaller and the faster you drive it the smaller it feels. Lamborghini insists this is the supercar of SUVs and it’s hard to argue with that. Regardless of the Tamburo setting, the Urus utterly erupts forward at every jump on the throttle. The only real difference is in the Sport and Corsa modes is that all of those eruptions are just much louder. We drove the Urus on the road, on the Vallelunga racetrack and on a soft dirt handling course (well, more of a rallycross circuit, if we’re being honest) and it gobbled them all up and looked for more. It’s engineering has overcome obstacles that have humbled less-committed car-makers and it can eat corners in ways that leave you braking later and later, sliding more and more and its enthusiasm never, ever fades away. The steering has more weight and directness in Sport and more again in Corsa, where the throttle response tightens up so much that it’s almost think-it quick to start hammering again. There’s nothing like the pitch under hard braking that you’d expect of something this tall and heavy. It just hunkers down and washes off speed at an eye-popping rate – harder than the original Gallardo – and preps itself for turning. And it doesn’t matter if you turn the Urus into fast corners while you’re still braking or from a more conventional straight-line stance, because its front-end will simply bite down hard on the tarmac and turn, calmly. The diff sends 60 per cent of its drive to the rear-end as its default idea, but up to 87 per cent when it needs to, and on the track it needs to, so it does. The result is a monster machine that eschews understeer in complete denial of its nose-heavy weight distribution, in favour of a near neutral stance all the time. It’s a jet on a racetrack, with the brakes hanging in indefinitely and only the tyres calling for a rest after a few laps of belligerence, and it all does a remarkable job of making the driver feel engaged and deep inside the machine, rather than sitting on top of it. And it’s easy to do, too. You don’t need to be a competition-standard driver to get a bunch of pace out of the Urus. You just need to remember to brake, turn and accelerate and then the Urus will take care of the rest for you. While the Urus is blisteringly fast on tarmac, it’s not quite as convincing on dirt. It raises the ride height and it’s a lot of fun, but the front-heavy weight distribution can’t be masked on loose surfaces like it is on tarmac. It hammers away from the line, bellowing and barking in Terra mode, but its mighty braking system has to fall back within the limitations of its tyres to wash off speed. And nobody is out there making 23-inch rally rubber. It also has to fight off understeer, especially in slow corners, and no amount of left-foot braking will swing the tail out enough to overcome it completely. It will get it done with a light slide if you’re patient enough, though. It’s brilliant and at its best flicking through fast corners, ‘five’ calls and upwards for anybody on a 1-10 pacenote system. On this kind of bend it can be drifted loosely in on weight transfer alone, then punched through under power before flicking back the other way and holding long slides that never feel threatening. But as for hard-core off-road work, well, we never saw any of that. And neither will anybody else, most likely. The ride quality is clearly at its best in the Strada mode, though over the notoriously broken roads of Lazio (the state that Rome calls home) there were times when it wasn’t smooth enough. Most of the time, yes, but sometimes not. Then again, those roads would make anything feel rough. Judge its ride on your own test drives. We suspect it’s smooth and comfortable enough, especially for its target audience, and it’s not worse than a Bentayga. The Lamborghini Urus gets considerably more jarring in Sport mode and, in Lazio, unbearable in Corsa (which is as it should be, given Corsa is a track mode). But ride is only one of the issues here. The gearshifts on the track are hard and loud and positive in both Sport and Corsa. At full throttle, they’re wonderful. At anything less than full throttle, Sport’s upshifts are a bit jerky and Corsa’s are unbearably hard (but, again, that’s probably as it should be). Maybe the biggest question mark remains over Lamborghini’s sales and marketing ideas for the Urus, and whether it has learned from the disaster the Bentley Continental GT was when it was originally foisted upon its dealer body. Dealers who read the Bentley playbook are already cautioning Lamborghini to take a lot of smaller bites to maintain Urus interest over its life cycle rather than trying to fill every order as soon as there’s interest and there is evidence that CEO Stefano Domenicali is listening. Bentley drove dealers out of business all over the world as they struggled to cope with volumes and trade-ins they weren’t equipped to deal with. Lamborghini is hoping to build 3500 Uruses a year, which will add about 15 per cent to its production volumes a year. It’s a real risk, as much as an opportunity. How much does a 2018 Lamborghini Urus cost?